It’s cheaper than ever to start a blog. You can set one up for less than the cost of a Starbucks Venti Mocha Frappuccino. You can be up and running in literally less than 30 minutes. Yet there’s a dizzying array of options, not to mention technical jargon that may sound like a foreign language to you. Fortunately, I’ve been through this before and can help you. You see, I’ve owned a web hosting business for 20 years and have been developing websites for more than 25 years. So I might know a thing or two about creating a blog. I’ve helped Fortune 500 companies such as Chase, IBM, Minolta, GM, Comedy Central, LensCrafters and Nielsen get online. BUT I’ve also helped individuals starting out… people just like you. I also know how to create profitable blogs, since I recently sold mine for $6 million. But first things first. Let’s not put the cart before the horse. You can monetize a blog in many many different ways, but I won’t cover that right now. Instead, I’m just going to go over the steps, the “lingo” and the technology stack required to start a blog from scratch. I created this ultimate guide from my years of experience and formatted it in a way that anyone can understand. Obviously, this how-to can’t cover every aspect of what it takes to create a successful blog, but at least it will get you started on the right path. Taking action for anything in life (be it losing weight, starting a business or learning a new language) is taking action. So take that first step and create your blog today. If you’re looking to cut to the chase, I recommend Bluehost as the one-stop shop for your domain name and web hosting needs. In my opinion, picking what to focus on is the hardest part of creating a blog. If you’re even reading this, I’m assuming you at least have some idea. Otherwise, why are you here, right? I’m also assuming most of you reading this want to create a blog to make money. You want to start a side hustle. But even if you’re just doing this for fun or another personal reason, what I’m going to tell you will still apply. However, keep in mind blogging isn’t a business unto itself. A blog is a means to an end, not the end. You’re creating a blog to let the world know your expertise in whatever niche you choose. If you’re creating a business blog, my primary suggestion is that you stay close to that niche. Don’t veer too far off that topic. So no stories about your cat on your fitness blog unless you’re somehow teaching cats to get buff. The most popular topics for blogs involve transformation. You’re writing to tell your story and/or help others learn how they too can transform from where they currently are to your end result. You can also choose to write about business-to-business related topics, but most consumer-based blogs do better. They also tend to be more interesting than a post on some new widget from ACME Inc. that is 2mm smaller and lighter than before. How Do You Know You Have a Great Niche? If you’re doing research on your topic and find little to no competition, that’s a bad sign. Gone are the days of looking for that unique business idea that no one has ever done. If there are no other businesses in that space, it’s for a good reason. You won’t be able to make money from it. What you need to do is find a niche that is moderate to very popular and execute better. Be better at writing content than the competing bloggers. Be better at promoting your content. Be better at monetizing your blog. Be better at building an audience. Be better with your blog’s graphic design. Add value where others are not. You see, when I started Investor Junkie, there were many other investment blogs out there. In fact, I had a previous business partner tell me it was a horrible idea to start another investment blog. The fact was, all those other sites stunk. I knew I could execute better than them, and I did. Which allowed me to eventually sell my blog. The competition spoke in technical terms that the average Joe or Jane couldn’t understand. So I created a website that could speak to that audience and educate them on the new investment services available. Think of it as your calling card. It’s the modern “phone number” of the internet. No one in the world will have the same domain name as you have. So make that domain name reflective of you and your ideas. It could be your own name (like this very website, LarryLudwig.com). It could be your company name (like mcdonalds.com). Or it could be some made-up name unique to any language. Being creative and unique is key. Avoid Hyphens and Underscores – Don’t buy domains with hyphens or underscores for your main address. However, I do recommend buying these in addition to your non-hyphenated version to make sure no one else steals your traffic. Go for the .com Extension – There are many other domain name extensions (such as .co, .app, etc.). Avoid them like the plague if possible for your domain, since they may confuse inexperienced internet users. No Spaces Allowed – You can’t have a space in a domain name. Easy to Spell – Is that with one “L” or two? People are horrible spellers; make sure your domain name is simple to spell. Easy to Remember – The domain should be catchy and something that others will remember. Buy the Alternatives – Buy not only the .com version, but also the .net, .org, .biz, and other alternatives as well. You’ll thank me later for preventing domain squatters from stealing your web traffic. Make Sure the Domain Can’t Be Something Else – Therapistinabox.com (Therapist In A Box) isn’t a good domain name. The classic bad marketing story involves the Chevy Nova automobile. GM introduced the popular U.S. vehicle in Mexico but couldn’t understand why the sales were so bad. They didn’t realize that no va in Spanish means “no go”! Don’t be like GM and buy a domain name that can have alternative meanings. Here’s a list of domains you do NOT want to emulate. You can search for your domain name right here. Brought to you by Namecheap. If you found that perfect domain name and want to create a business around it, make sure it’s not already trademarked. Just because the domain is available doesn’t mean someone hasn’t already trademarked the name. If your business is based in the U.S., use the trademark search database. It used to matter to Google what the domain name was for a topic. So if you wanted to write a blog about bowling balls you would have done best buying a domain name with those two words in it (i.e., bowlingballs.com). You also would have automatically ranked higher for the term “bowling balls.” Today, not so much. So while it would make sense to buy a domain name related to the topic you picked, you no longer have to pick one just to make sure you rank in a Google search. You could use some made-up name. To purchase domain names, I recommend Namecheap. It’s cheap (hence the name) and easy to use. When I first started in the 1990s, domain names were very easy to come by. It was easy to register pretty much anything with a .com at the end. Today a lot of the great domains are already taken, but don’t despair. You have a few options available to you. What if you’re looking for something already registered? Many domain names are purchased by what we call “domain squatters.” No website has ever been built on these domain names. The squatters buy these domains with the hopes of selling them at higher prices to someone else. There are active exchanges in which you can buy/sell existing domain names. Well, Namecheap has got this covered as well with its marketplace. Namecheap has thousands of already registered domain names available for sale. You can search for an available domain and bid on it. Keep in mind, you are buying from private owners. Each domain has a unique value to it, and the arrangement is between you and the seller. Namecheap makes the buying and transfer-of-ownership process easy and seamless. 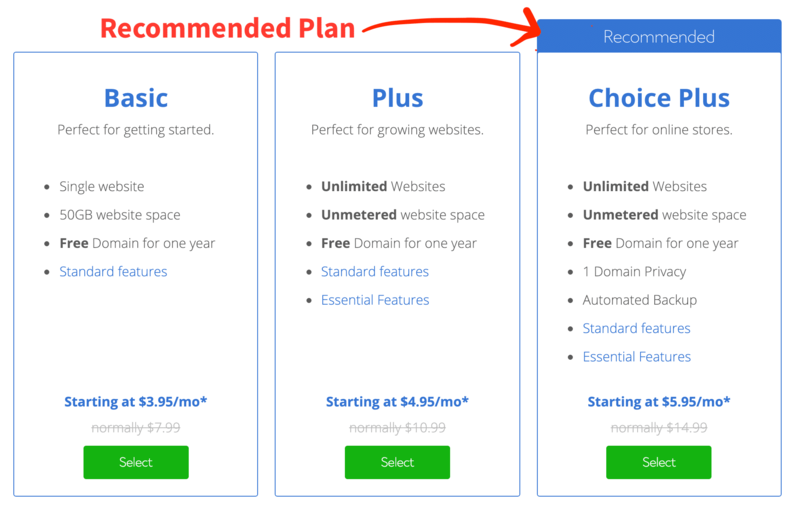 It’s possible to get a free domain name with my hosting recommendation. However, this isn’t without its restrictions. There are many free blogging options, and they’re fine if you aren’t a business. But using one of these suggests you aren’t professional or serious. It’s pretty much the same as putting an AOL email address on the side of your business van. Pay for your domain name and web hosting. As I said at the beginning of this how-to, when you first start out out, blogging costs about the same as going to Starbucks once per month. Skip that cup of coffee and invest in your business. When I first started over 20 years ago, web hosting could have easily cost hundreds per month, taken hours to set up and required you to be a system administrator whizkid. Today, you can buy a domain name and web hosting and be on your way in under 15 minutes. So if a domain name is like a phone number, then web hosting is renting an apartment. You can rent a basic studio apartment in the city, but you can also rent a five-bedroom mansion out in the countryside with three acres of property. If you’re just starting out, I recommend going with the studio apartment. It’s going to be a little cramped, but you’ll save more money. However, just like renting an apartment, shared hosting isn’t perfect. Say you’ve got noisy neighbors whose loud late-night partying makes it hard for you to get up early for work in the morning. Well, with shared hosting, you can get noisy neighbors too. Sometimes another website on the same server can affect your site’s performance. Realize that this is a possibility with a beginner web hosting plan. As your site grows and generates real revenue, consider switching to a better-suited hosting plan. For the blogger just starting out, I recommend Bluehost. If you start generating real income from your blog, there are other hosts I’d recommend, but for just starting out, Bluehost will work just fine. Yes, it’s possible to go with Bluehost for your FREE domain name registration as well, but you’ll have more restrictions than you will owning it outright with Namecheap. I recommend the Bluehost Choice Plus plan because it lets you hide your personal address information. It’s required that all domain name contact information be available through the WHOIS database. You don’t want to broadcast your name, phone number, etc., to just anyone. With this plan, a WHOIS search of your domain will yield generic Bluehost results. If buy your web hosting from Bluehost and then follow Step 2 and purchase your domain name from Namecheap, you need to point that domain name to Bluehost. This is a critical step; otherwise your readers will just get error screens instead of your blog. You can read up on how do this in this in-depth blog post. In order to create content on your website, you need software that allows you to easily make new blog posts. When I first started you literally had to build your own software to do this. But not today. In internet speak, software used to create and manage content is called CMS (content management systems). There are hundreds of free and commercial CMS programs. The problem is, which one should you choose? It’s very popular and free to use, has many add-ons and now integrates with pretty much everything out there. In fact, according to WordPress, the software currently powers more than 32% of the internet. Plus, if you choose Bluehost as your web host, connecting with WordPress is easy! Bluehost can install WordPress with one click via your control panel. You can read up on how to do this in Bluehost’s online tutorial. If your domain name is your phone number and your hosting is renting an apartment, then your WordPress theme is your interior decor. This is the front-facing portion of your site that everyone sees. And as with meeting someone the first time, first impressions count! Studies show most users spend less than 15 seconds on a website before deciding if they want to stay there. If you’ve surfed the web enough, I’m sure you’ve seen some very similar-looking sites. Why is that? It’s because they’re using the same WordPress theme! So be wary of picking a generic-looking or default WordPress theme. Choose one that stands out from the crowd. This is a simple but effective way to brand your site. That’s why I recommend StudioPress, which makes the WordPress theme Genesis. StudioPress offers many themes for many different types of blogs. You can tailor the themes to your specific needs and customize them to your exact liking (for the advanced user). I’ve been using StudioPress themes for over five years. I recommend Genesis to everyone. StudioPress themes are easy to install and customize and are very search engine friendly. They’re my WordPress go-to. WordPress out of the box is just OK. This is where plugins come into play. There are literally thousands of WordPress plugins. In fact, I’ve developed a few myself. Most are free to download and use, but in many cases, you get what you pay for. There are commercial plugins as well. Which to use? Yoast SEO – A very popular plugin that helps with your SEO (search engine optimization) and social media. MonsterInsights – You need to measure the visitors to your blog. This plugin works with the Google Analytics free service. OptinMonster – If you want more signups to your mailing list (and who doesn’t? ), then you must use this plugin. Social Warfare – Make it easy to share your posts via social media. This plugin helps your blog posts go viral. BackupBuddy – Don’t rely on your web hosting provider to make backups of your site! Make sure you are in control and have off-server backups. The last and most important step. Start writing! You’ve gotten this far. Take action and create some content. What specific content you should write is a whole different subject that I won’t cover here. Like any new venture, this is a long game. Don’t get discouraged if you don’t see instant results. I wouldn’t expect real results for the first two or three months until you get in your groove. Write for your audience’s needs, not yours (however, they might be the same). Write on a regular basis. Start off with a goal. I recommend a new post once a week. Focus on quality, not quantity. Write epic posts that have at least 2,000 words of in-depth insight, rather than a whole bunch of useless 400-word articles. Promote. If a tree falls in a forest, does it make a sound? Post on social media, figure out SEO and create a mailing list so your readers can receive updates.